A credit card is a plastic card issued by financial companies, usually banks or credit unions. It allows the holder to pay for goods and services based on the promise made by the holder to pay for them at a later date. Credit cards have become common place in personal finance over the last few years, their popularity is reflected clearly in the number of people who are credit cardholders. A Statista survey carried out in June 2018 revealed that 83 percent of Americans between 30 and 49 years owned a credit card. The main benefit to the customer is convenience. Compared to debit cards and checks, credit cards allow the holder to take short-term loans without the need for calculating their remaining balance before making a transaction. This can, however, also be seen as a great disadvantage as it may lead the consumer to make purchases they cannot afford. This can often result in difficulties for the cardholder in the form of credit card debt. Low introductory credit card rates are limited to a fixed term, after which much higher rates are often charged. In total, credit card debt in the United States amounted to approximately 0.83 trillion U.S. dollars in the second quarter of 2018. Some credit cards can often levy rates up to 30 percent if a payment is missed, some customers become so indebted to their provider that they are driven into serious financial difficulty and sometimes even bankruptcy. 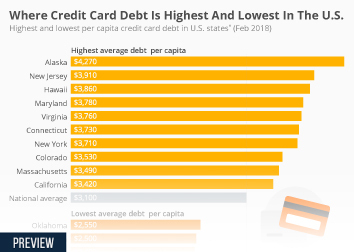 The level of credit card debt varies between states. Value of credit card debt in the U.S.